We are local retired people who have formed a branch of the University of the Third Age (commonly referred to as the U3A). Not a university in the conventional sense, in the U3A everyone's interests, skills and experiences are valuable and we all learn from each other. Costs are kept low by members themselves organising and leading group activities. 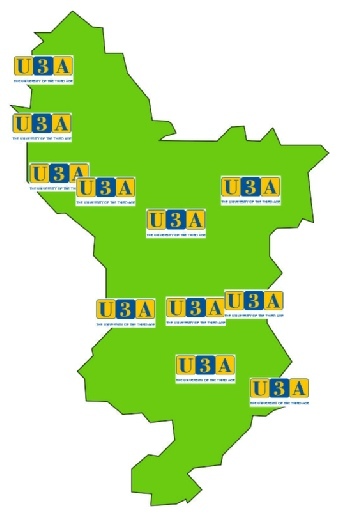 We aim to provide equal rights of access for all to our U3A activities. In 2014 we held a Disabilites Sub-Commitee which was set up to further this aim. Our resulting Accessibility Guidelines are given below. Click on any of the links at the bottom of the page for more information. To identify and support members and prospective members who have disclosed a difficulty relating to visual and hearing loss, mobility and general health issues. To help provide reasonable support for those members to enable them to access group and general meetings. To assist group leaders by providing information on support structures available through charitable institutions and organisations, the Third Age Trust and/or local government services. To create the role of Accessibility Officer whose remit will be to provide information and support to members and group leaders as above (Hazel Perry, access@newmillsu3a.org.uk). To advise and support speakers at general meetings on reasonable adjustments which support our aims. This web site publishes announcements and reports about our U3A activities, including descriptions of our activity groups and contact details at the discretion of individual group leaders. We are generally unable to include advertising from other organisations or personal advertising from our members.